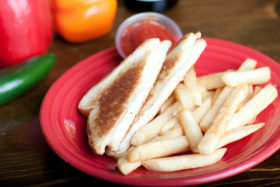 Kids meals served with one choice of Mexican rice, refried beans or french fries. Choose one filling: Beans, Cheese, Shredded Beef or Shredded Chicken topped with mild enchilada sauce and garnished with lettuce and sour cream. Crispy and juicy fried chicken fingers. Grilled ham & cheese sandwich. 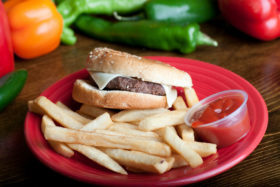 Cheese burger topped with lettuce & diced tomatoes. Choose one filling: Shredded Beef or Shredded Chicken in a soft or hard shell tortilla with lettuce & diced tomatoes.